A BETTER BRUNCH COOKBOOK by Ellen Mayford (C) 2009 Solar-Vision Publishing/2009/BRAND NEW/Softcover! 44 JAM PACKED pages!! 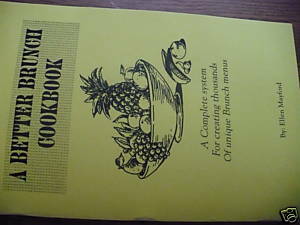 This is a very UNIQUE Brunch Cookbook, the only one of it's kind in fact!! Forget everything you've heard about what BRUNCH is, or what Brunch should be - This cookbook takes all of the mystery out of Brunch, defines it, and presents you with recipes you actually WANT to make, and not just a collection of bizzare dishes you've never even heard of! Most other Brunch cookbooks will give you perhaps a dozen "Menus" - This book goes light years beyond them all and presents a very unique "system" in which you are given FIVE very specific, distinctive "sections". You then simply follow a formula by choosing a specific number of dishes from each section of the book, and you're on your way to preparing a BRUNCH TO REMEMBER!! Following this unique, exclusive system, you can literally prepare THOUSANDS of different menu combinations by simply choosing different dishes from each section each time. There is nothing hard about this - ANYBODY can be on their way to being a BRUNCH EXPERT in no time at all just by using the book once or twice. It's as easy as picking your dishes and making them! Worry no more about what you're going to fix at the next luncheon, or how to put together a good menu. THIS BOOK will solve that problem for you forever, and that's the truth. A cookbook to cherish forever with perfectly well rounded recipes, expertly categorized....YOU CAN'T GO WRONG!